The events that took place in a remote area of New Mexico during the predawn hours of July 16, 1945 forever changed the world. In the early morning darkness the incredible destructive powers of the atom were first unleashed and what had been merely theoretical became reality. The test was the culmination of three years' planning and development within the super secret Manhattan Project headed by General Leslie R. Groves. Dr. J. Robert Oppenheimer directed the scientific team headquartered at Los Alamos, New Mexico. An isolated corner of the Alamogordo Bombing and Gunnery Range located 230 miles south of Los Alamos was selected for the test that was given the code-name "Trinity." Even before the bomb was tested, a second bomb was secretly dispatched to the Pacific for an attack on the Japanese city of Hiroshima. Preparations for the test included the building of a steel tower that would suspend the bomb one hundred feet above ground. Many were apprehensive - there were concerns that the blast might launch a cataclysmic reaction in the upper atmosphere leading to world destruction. 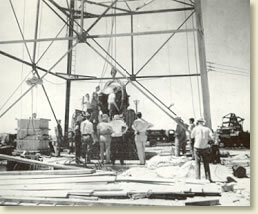 Some feared the consequences of radio-active fallout on civilian populations surrounding the test site. Still others feared the test would be an outright dud. Observers were sent to surrounding towns to monitor the results of the blast and medical teams were kept on alert. Finally, the rains that had delayed the test for almost two weeks subsided and in the darkness of that July morning history was made. "We were reaching into the unknown and we did not know what might come of it." "The scene inside the shelter was dramatic beyond words. In and around the shelter were some twenty-odd people concerned with last minute arrangements prior to firing the shot. 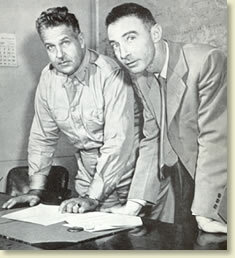 Included were: Dr. Oppenheimer, the Director who had borne the great scientific burden of developing the weapon from the raw materials made in Tennessee and Washington and a dozen of his key assistants - Dr. Kistiakowsky, who developed the highly special explosives; Dr. Bainbridge, who supervised all the detailed arrangements for the test; Dr. Hubbard, the weather expert, and several others. Besides these, there were a handful of soldiers, two or three Army officers and one Naval officer. The shelter was cluttered with a great variety of instruments and radios. physicists' dreams. It was almost full grown at birth. It was a great new force to be used for good or for evil. There was a feeling in that shelter that those concerned with its nativity should dedicate their lives to the mission that it would always be used for good and never for evil. Dr. Kistiakowsky, the impulsive Russian, [actually an American and a Harvard professor] threw his arms around Dr. Oppenheimer and embraced him with shouts of glee. Others were equally enthusiastic. All the pent-up emotions were released in those few minutes and all seemed to sense immediately that the explosion had far exceeded the most optimistic expectations and wildest hopes of the scientists. All seemed to feel that they had been present at the birth of a new age - The Age of Atomic Energy - and felt their profound responsibility to help in guiding into right channels the tremendous forces which had been unleashed for the first time in history. As to the present war, there was a feeling that no matter what else might happen, we now had the means to insure its speedy conclusion and save thousands of American lives." General Farrell's account appears in - Department of State, Foreign Relations for the United States Conference of Berlin (Potsdam) (1945); Lansing, Lamont, Day of Trinity (1965). "The First Atomic Bomb Blast, 1945," EyeWitness to History, www.eyewitnesstohistory.com (2003).